A newfound hunk of ice and rock beyond Neptune is larger than most and might contend for the title of the biggest object in the solar system besides the Sun, planets and moons. The object is in a region of frozen, comet-like bodies called the Kuiper Belt. 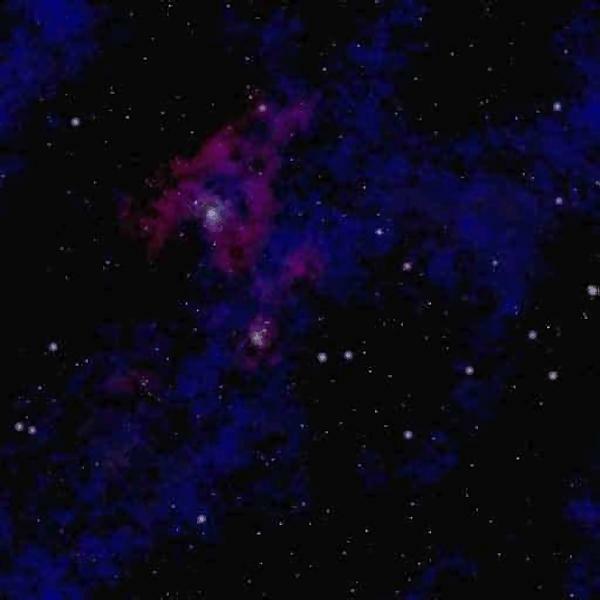 The discovery was announced by the Minor Planet Center in Cambridge, Mass. Preliminary observations suggest the icy rock, labeled 2004 DW, is 520-1,170 miles wide (840 to 1,880 kilometers). Physics dictates that objects this large be generally round, like mini-worlds. The largest known Kuiper Belt Object, or KBO, is called Quaoar (KWAH-o-ar) and was discovered in 2002. Quaoar is roughly 780 miles (1,250 kilometers) wide, about half as big as Pluto. It orbits the Sun every 288 years, mostly beyond Pluto's orbit. More observations will be needed to pin down the size of the newfound KBO. It may turn out to be much smaller than Quaoar, or it could be bigger. Researchers estimate the size of these objects by noting their brightness and making assumptions about how much light they reflect. Those assumptions assume a certain level of reflectivity for the surface material. The discovery was made by Caltech's Mike Brown and colleagues Chad Trujillo and David Rabinowitz as part of the same survey that found Quaoar two years ago. "The object is probably about 1,600 kilometers in diameter, larger than the 1250-kilometer Quaoar," the researchers stated in a web posting. "If subsequent measurements verify this size estimate, this would make 2004 DW the largest minor planet known, and larger than Pluto's moon Charon, which is about 1,300 kilometers in diameter. This still doesn't beat Pluto, which is about 2,300 kilometers in diameter." The finding was confirmed with observations by a team based at the Starkenburg Observatory in Germany and other sightings from the Jet Propulsion Laboratory's Table Mountain Observatory in southern California. Researchers measure an object's movement against the fairly stable background stars to gauge its distance. 2004 DW is nearly 47 times as far from the Sun as Earth is. Scientists expect more large objects to be found in the Kuiper Belt now that search techniques and technology have been refined. Some astronomers say it's possible that an object larger than Pluto might still lurk there unfound. The object is catalogued as 2003 VB12 and has unofficially been dubbed Sedna, goddess of the sea for Arctic dwellers. Mike Brown thought that appropriate given the frigid conditions under which the solar system body has probably always existed. The International Astronomical Union would have to approve the name. The discovery was led by Dr. Mike Brown, who discussed it at a NASA press conference. Brown does not consider Sedna to be a planet. He and many other astronomers maintain that Pluto should not have ever received planet status, either, since astronomers are now finding myriad round objects beyond the orbit of Neptune, and several of them are quite large. Pluto is about 1,413 miles (2,274 kilometers) wide. Sedna is estimated at no more than 1,100 miles (1,770 kilometers) in diameter. It may be the largest object in the solar system after Pluto, but more observations are needed to pin that down. Sedna is some 8 billion miles away, or 86 astronomical units (AU) from the Sun. One AU is the distance from Earth to the Sun (93 million miles). Pluto is, on average, 39.5 AU from the Sun. But Sedna's orbit, tracked since November when it was first spotted, can bring the object out to some 84 billion miles. It is a very elliptical orbit. "If you were stand on the surface of Sedna today and you held a pin at arms length, you cold cover the entire Sun with the head of that pin," Brown said. Even the largest backyard telescopes would have a hard time spotting Sedna from Earth, he said. The region beyond Pluto is commonly called the Kuiper Belt. It is loaded with icy objects large and small. Brown said Sedna may be the most primordial object ever detected, having undergone very little heating by the Sun and having had few collisions in the sparse region of space where it resides. Other objects in the solar system, according to the latest thinking, have typically been transformed significantly since their formation. The next two largest Kuiper Belt Objects were also discovered by Brown's group. Both were much closer. Last month, the team announced 2004 DW, which was estimated to be between 520-1,170 miles wide (840 to 1,880 kilometers). The best estimate is that 2004 DW is 994 miles across (1,600 kilometers). It is nearly 47 AU from the Sun. In 2002, the group found 2002 LM60, also named Quaoar (KWAH-o-ar). It is roughly 780 miles (1,250 kilometers) wide, about half as big as Pluto. Quaoar is 42 AU from the Sun. 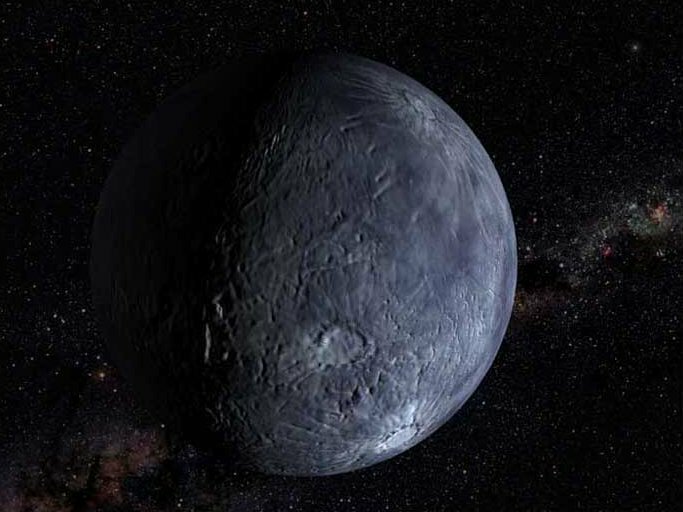 Eugene Chiang, an astronomer at the University of California at Berkeley, stated that the discovery of Sedna adds to the case that Pluto is more like a Kuiper Belt Object than a planet. He called Pluto's discovery, in 1930, an accident of history. "If Pluto were discovered after all these discoveries, would we have called it a planet? No," said Chiang, who was not involved in the Sedna discovery. Brown said Sedna occupies a region of space beyond the Kuiper Belt but inside the theorized Oort Cloud, a distant reservoir of icy comets that are detected only when they zoom through the inner solar system on occasion. The Oort Cloud is thought to extend halfway to the next known star, but scientists know almost nothing about its scope, density or composition. Dr. Brown said the discovery suggests the Oort Cloud might be more dense -- containing more objects -- than was previously thought. "It is very likely that there are more inner Oort cloud objects like Sedna," Brown says, noting that only 15 percent of the sky has been surveyed for objects so dim as this. 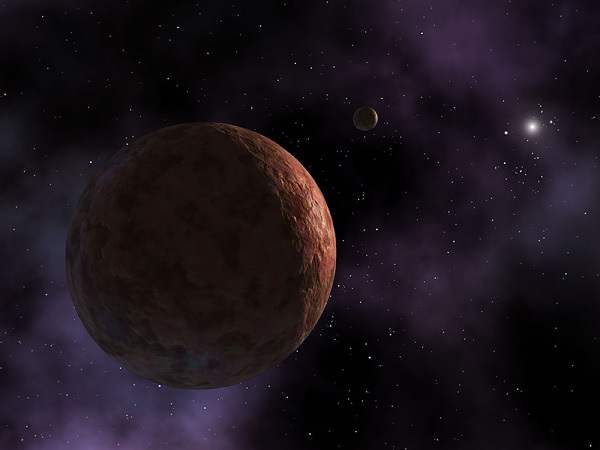 Sedna probably was formed nearer to the Sun, in what's now the Kuiper Belt. Like other objects there, it would have been gravitationally booted outward by the giant planets early in the 4.6-billion-year history of the solar system. Many such objects should have been ejected from the solar system. But interactions with very distant stars could have forced some to remain in the Oort Cloud. Sedna's presence suggests, Brown said, that the Sun might have formed in a neighborhood more tightly packed with stars than what's evident today. Other theories of planet formation have suggested this, too, holding that the Sun was long ago booted out of the star cluster in which it was born. It is not certain, however, that Sedna should be considered part of the Oort cloud, said Alan Stern of the Southwest Research Institute. "I think it's a really cool find," Alan Stern said, but he added that it was "not unexpected." Stern heads up NASA's New Horizons mission that will launch in 2006 and explore Pluto and the Kuiper Belt. He expects the spacecraft to be functional at least out to 50 AU -- short of Sedna's distant location. Stern and others have long theorized that there would be many objects beyond the orbit of Neptune. He said Sedna might turn out to be a Kuiper Belt Object that has been scattered outward. The problem, he said, is that scientists don't know enough about either region to say for sure what belongs where and what is or isn't in between. "I think the jury is out on whether it's a scattered Kuiper Belt Object or an Oort Cloud object," Stern said. "There's a fair chance Mike Brown is right." Stern said it is not even clear whether there is actually a gap between the two regions. Stern said only multiple missions to the Kuiper Belt and beyond would answer all the questions he has about the far reaches of the solar system. Scientists don't know what Sedna is made of, but they presume it is about half ice and half rock, like other distant solar system bodies. But Sedna appears redder than all but Mars, Brown said, and observations over the next six months or so aim to learn why. Observations suggest Sedna has a satellite -- a small moon, but further study is needed to determine if that's the case, Brown said. He and other astronomers would not be overly surprised, as several Kuiper Belt Objects, as well as Pluto, have satellites. Sedna's surface temperature is about minus 400 degrees Fahrenheit (-240 Celsius), the coldest known place in the solar system. Sedna was found using the 48-inch Samuel Oschin Telescope at Caltech's Palomar Observatory near San Diego. The discovery was confirmed with other observatories, and the object's size was pinned down using NASA's new Spitzer Space Telescope. 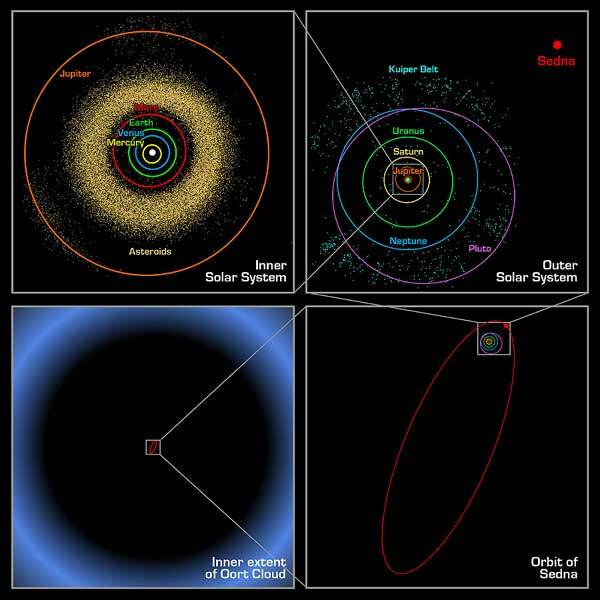 The location and orbit of the new object is shown in context with the orbits of the Solar System, known asteroids and Kuiper belt objects, and the hypothesized Oort cloud of distant objects orbiting the Sun.